• Pending is a series of drawings in an expired passport, which include a single-entry student visa issued for arrival to the United States. A visa that does not promise a re-entry if one decides to leave the country. In this series, the artist depicted some intimate family moments over the time living apart from each other without having an access to get together. The drawings explore the inseparable politics of family and exile. 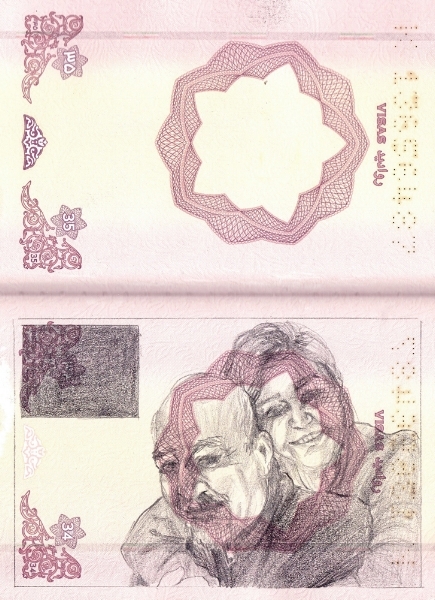 The long bureaucratic visa processes, administrative endeavor, unanswered correspondence, the reluctance of administrators to provide information on the visa status, numerous unsuccessful calls to people in charge, and financial hardships all lead to these family moments becoming metamorphosed into momentary conversations on Skype, or Facetime.